- EC 302 : This error occurs when the temperature doesn't rise above 10ºC within 30 s from the initiation of heater. - EC 306 : This error occurs when the difference between the targeting temperature and device temperature is over 20ºC and continues more than 5 mins. 1. 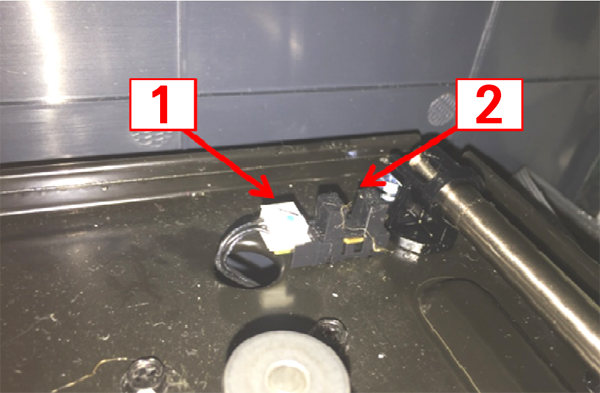 Turn off the device, open the nozzle cover, and detach the connector (connected to the red harness) on the right. Refer to the Page 130 of the User Manual. 2. 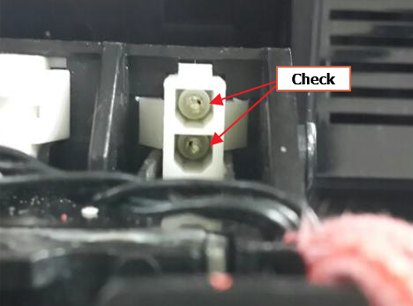 Check the interior of the connector of the nozzle and the main board to see if there are any impurities. 3. 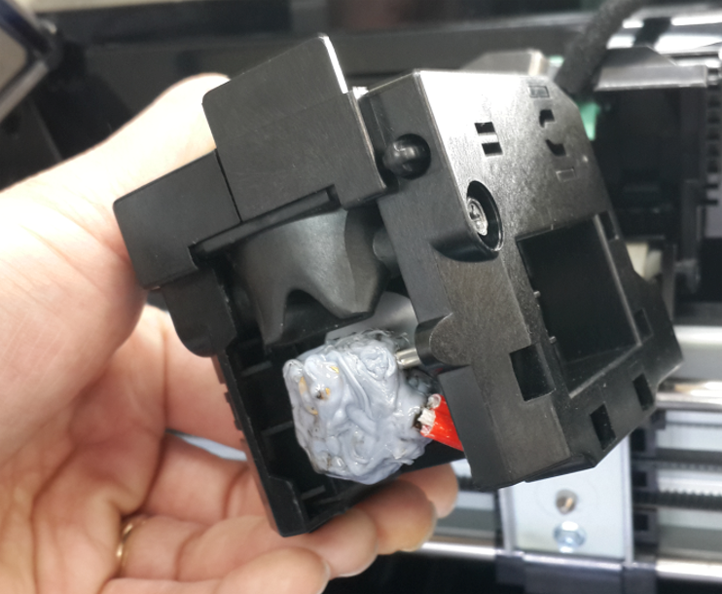 If no impurities are found, reattach the connector. 4. Turn the device back on and check if EC-306 or another Error Code still occurs. Nozzle Sensor status does not change after Booting 3DWOX. 1) Make sure that the Nozzle Assy is properly attached. - If the Nozzle is out of position, please refer to the '5. Maintenance - 5-12 Assembling the Nozzle', reposition the Nozzle and close the Upper Cover. - Check and Make sure that the Upper Cover is holding firmly. 2) Power off the 3DWOX and move the nozzle to the leftmost position to check if the sensor is working properly. 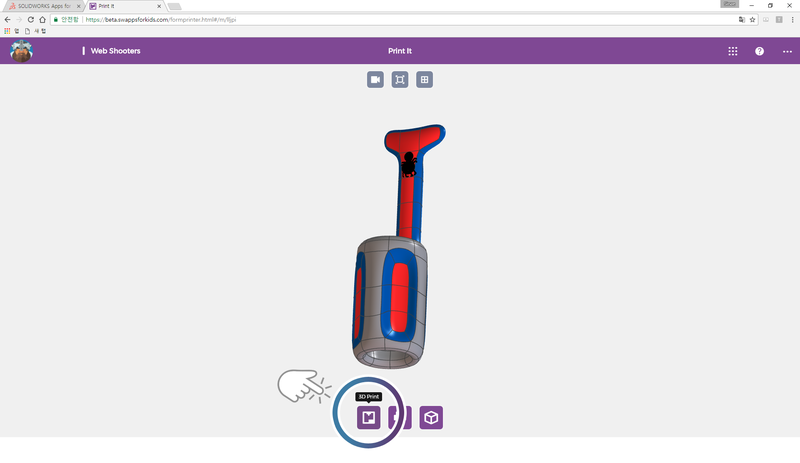 - If the Nozzle is pushed all the way to the left wall, there will be a click sound. When the Nozzle is pulled back rightward, the sensor status changes. 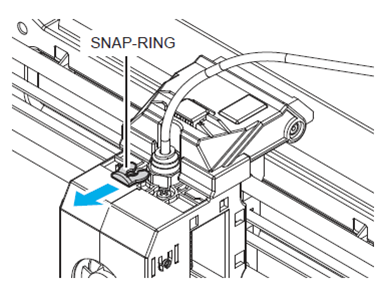 - If the Nozzle is once again pushed to the left, there will be a click sound and the sensor status is switched again. - After Checking the Nozzle Multiple times, reboot the 3DWOX to check on the EC pop-up. * There may be a delay due to debris, but the Nozzle will get back to its normal status after several Nozzle checks. - Check the Nozzle Sensor by fully pushing the tip of the Nozzle Assy on the left. The filler, located on the bottom of the Nozzle, should move up and down. 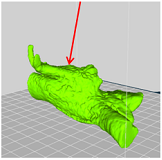 1) This probelm can occur when the print bed is not inserted. 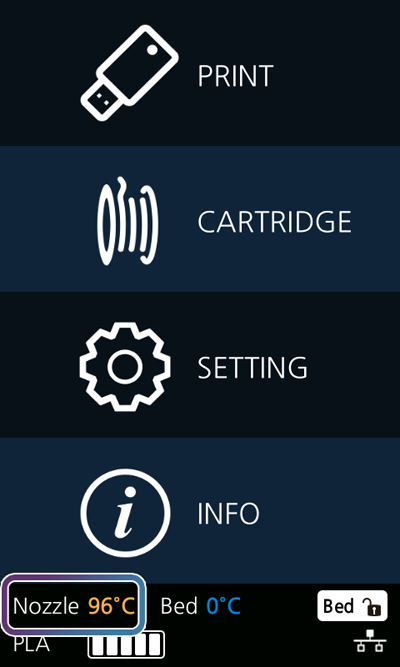 You may check the version of your firmware on the "info" menu under "3dwox lcd ui." The most recent version of the firmware can be downloaded through the website below. 1. Please open zip file and save the '_update_rodin' as root folder on a USB flash drive. 2. 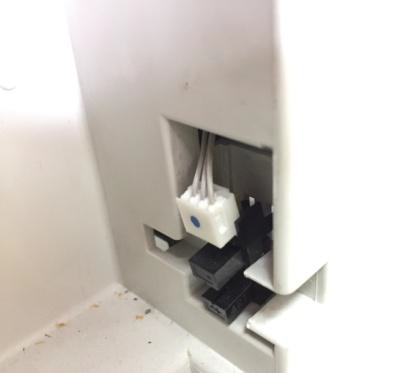 Insert the USB flash drive to the port located in the front of the machine. 3. Turn the machine on and update will start automatically. 5. The update is complete. 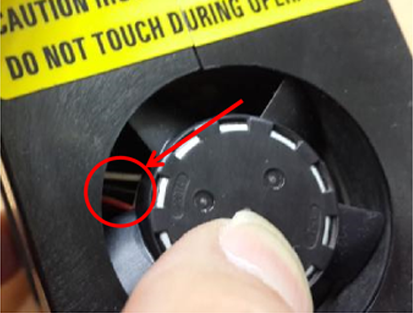 Please check if the Fan #1, 2 of the nozzle in the image below spins several times before Error Code 321, 322 message pops up. 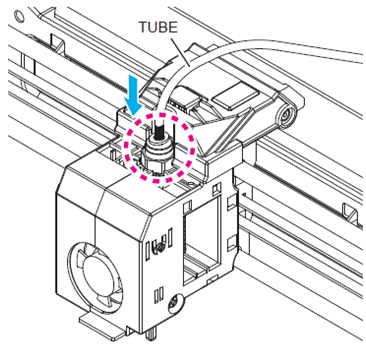 If it doesn't spin, please follow the instruction under 5-10 section on user guide to disassemble the nozzle (The user manual can be found at http://3dprinter.sindoh.com/ Downloads). - If the material/obstacle can be located, please try to remove it with tweezer. 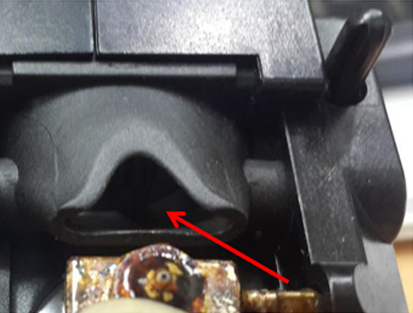 - If the material/obstacle cannot be located, please see the airduct on the bottom side of the nozzle as well. * Caution: The White, Black, Red cords inside are electrical cords, not the materials/obstacles that are disrupting the operation. See if it turns without any problem (There are 2 fans so please compare it with the other fan on the nozzle). * Please note that the 4th step to this instruction has been revised as in the below. * Before -> Approx. 50mm of the tube is inserted. Push the tube in until the black indicator is unable to be seen. * After -> Approx. 50mm of the tube is inserted. Push the tube in until the tube under the black indicator is unable to be seen. Follow the UI instructions and start the auto recovery process, after the recovery process if problem persists follow the below steps. 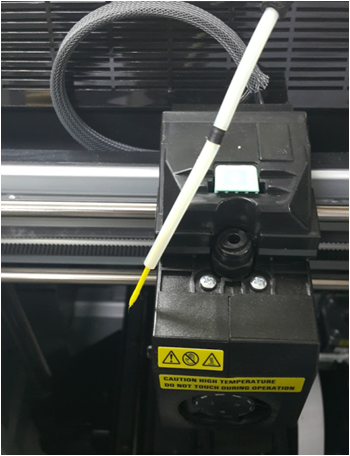 [STEP 1] Unlock the Cartridge -> Remove the Cartridge from the Printer -> Go to Setting - Extruder mode and Press "100" as the transfer length and Press the arrow directed away from the Nozzle to remove the Filament completely from the printer. 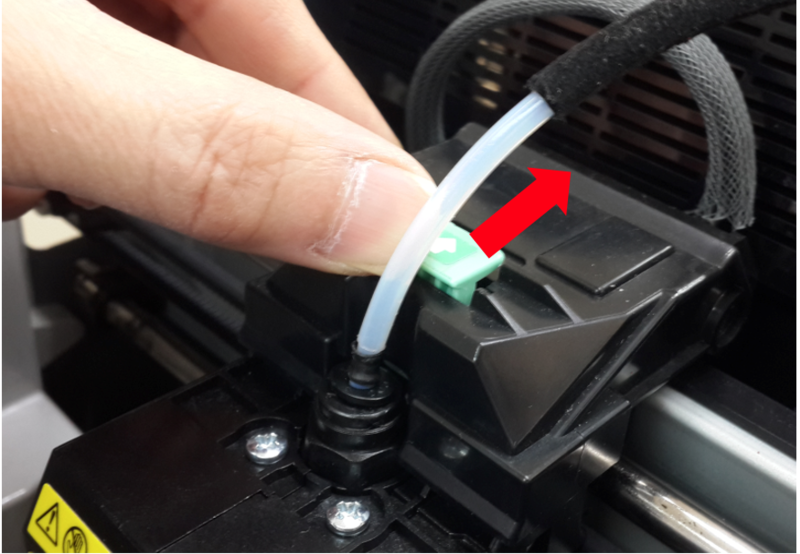 - Remove the Filament that is sticking out of the Cartridge (refer to the image below). 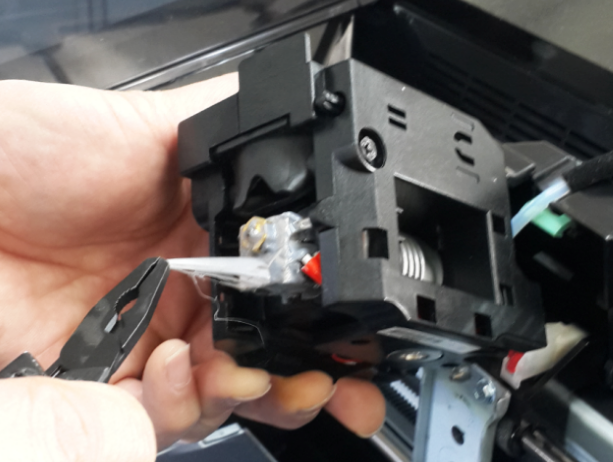 - Open the Cartridge and make sure that there are no entanglements inside the Filament spool (Separate manuals available for A Type and B Type Cartridges). 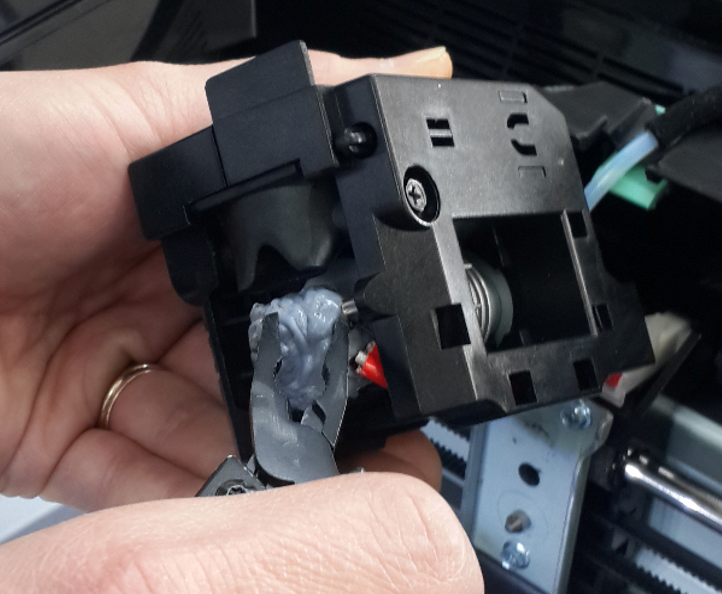 Reassemble the Cartridge and begin loading the filament. If Notification 476 Occurs, Press "No" and repeat the loading process. - When the ends of the Filament is sharp and acicular filament will run through easier. 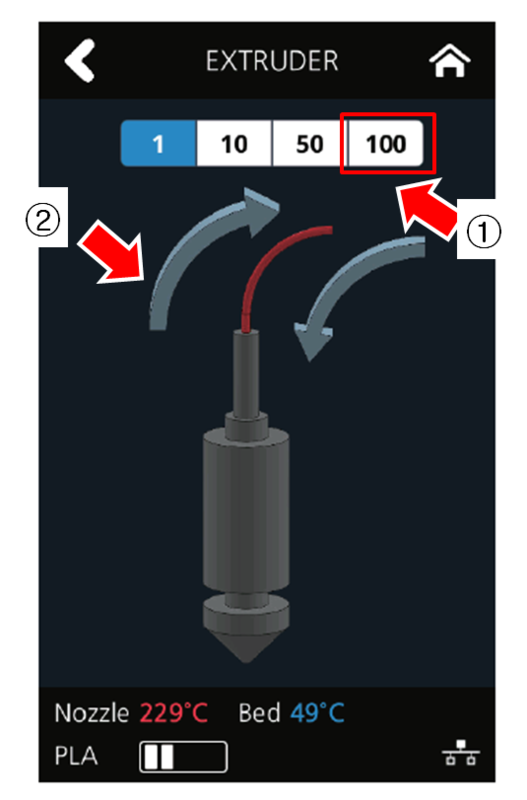 - Please check that the end tip of the filament is properly transferred to the top of the Nozzle on the last part of the [STEP 1], Loading Process. 1. 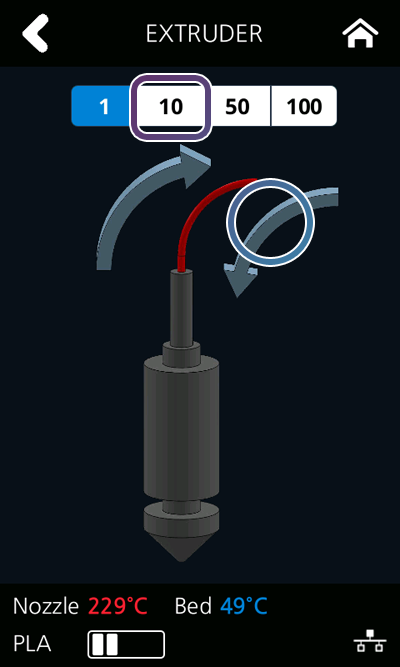 If the Filament is transferred properly, move on to [STEP 2]. 2. If there is a problem during the process, please Contact Us with the details (including images and videos). [STEP 2] Go to Setting - Extruder mode. Press "100" as the transfer length and Press the arrow directed towards the Nozzle. 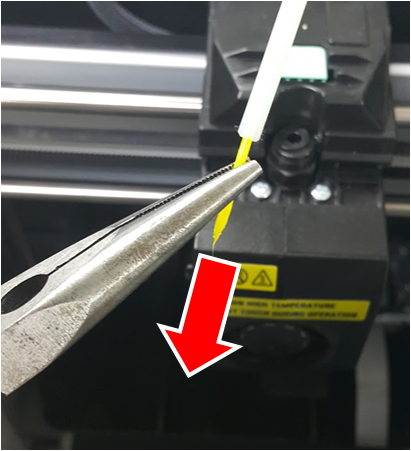 - Please make sure that the Filament is properly excreted out of the Nozzle when the transfer length of 100 is selected and the arrow directed towards the Nozzle is pressed. 1. If the Filament is properly excreted, move on to [STEP 3]. 2. 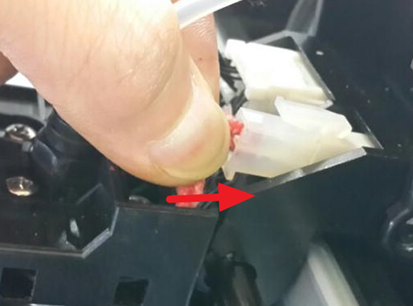 If the Filament is not excreted, repeat [STEP 1] & [STEP 2] two to three times for recheck. If the problem persists, please Contact Us with the details(including images and videos). 1) Remove the debris near the end tip of the Nozzle. 4) Press "Move" to adjust the gap between the Nozzle and the Bed and make sure that a paper with a thickness of 0.25 mm (Thickness of a Business Card or two sheets of paper folded) can pass through the gap. The optimal gap would be the paper slightly scratching the Nozzle tip. 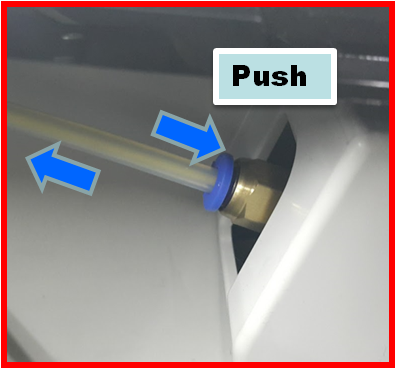 5) If the paper cannot pass through the gap or does not scratch the Nozzle tip , Press "+/-" to change the gap value(increase in value results in larger gap), Press "Save" and then Press "Move" to recheck the Gap. - Redo the printing. If the problems persist, please contact the Customer Service. 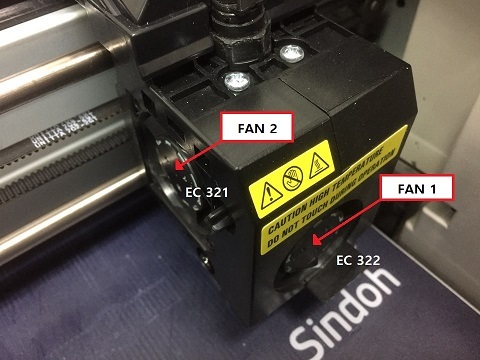 - Please check if the EC 401 reappears when printing. 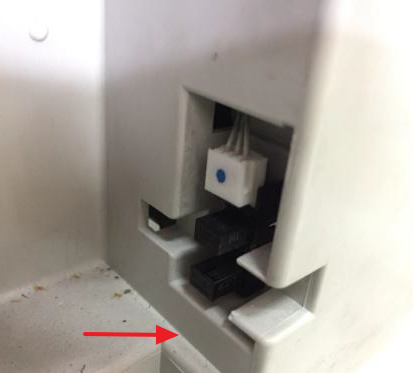 If EC 401 reappears, please Contact Us with the details, including when the error occurred(images and videos), how often it occurred, material used (PLA or ABS), and the serial number. It is located where a dotted circle is above. 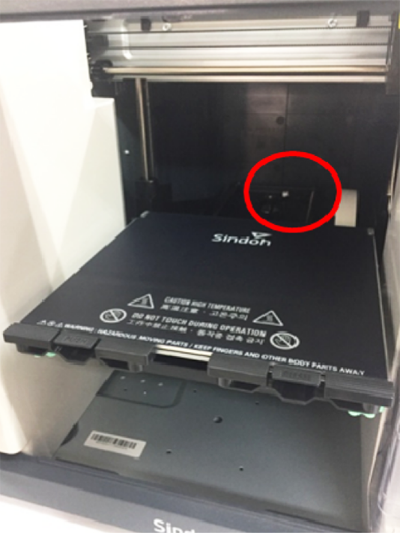 A sensor is located inside the printer as shown in the picture above. (Left Picture) Normal - The sensor does not move when pushed inward. 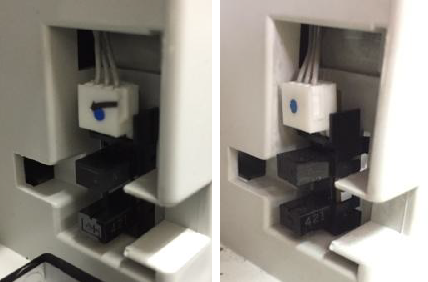 (Right Picture) Abnormal - The sensor goes out of position when pushed inward. 2.Tilt the Sensor and insert the lower part to the hole first. 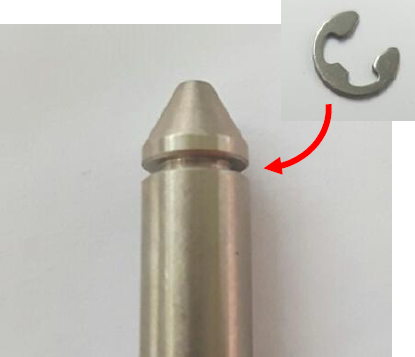 Finish re-assembling by inserting the upper part. There is a problem with the sensor for Y-axis. 1. 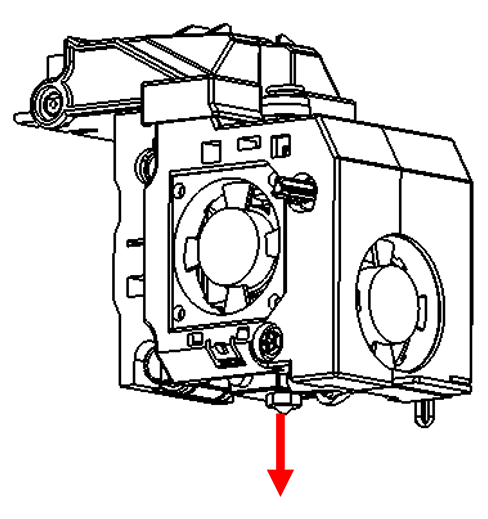 To check the sensor, adjust the bed as shown in the picture below. 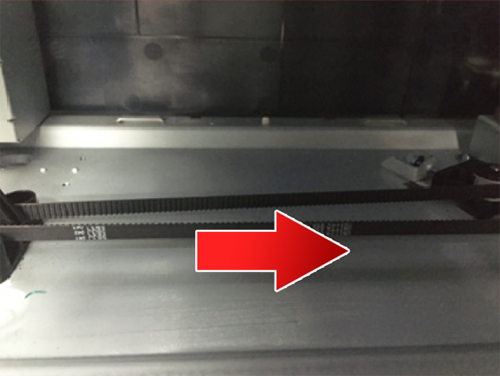 Move the belt marked in the picture to pull the bed plate down. Pull the belt in the direction shown in the picture. When the bed moves down to certain level, pull the bed plate . Check the Sensor behind the Bed Plate. 1) Please make sure the Harness is well connected. 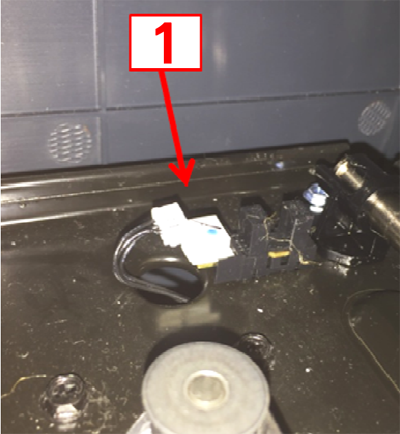 2-1) If anything is stuck near Sensor detector part as shown in the picture, remove it and reboot the printer. [Trouble Shooting] The power is on but the LCD does not work. Please turn off the machine and re-insert the SD card for reset. Check if filament is inserted to the ends of the nozzle. Using the extruder option, move the filament towards the nozzle. 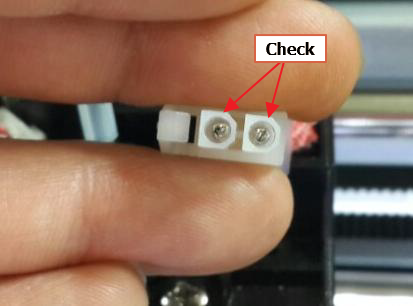 Please check if filament is discreted. If there is no problem, please run nozzle cleaning. However, If problems persist, please contact us. 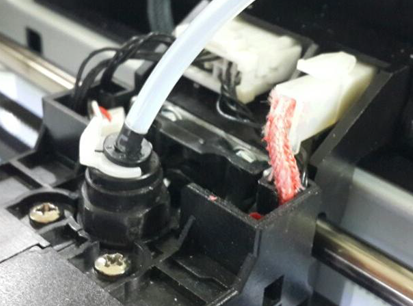 After unloading the cartridge, check if there is any leftover filaments within the printer. Afterwards, try re-installing the cartridge. If Load/Unload process was not completed properly, an error message and instructions will be displayed on the screen. Follow the UI instructions and contact us if the problem persists. [Trouble Shooting] An object is placed either too close to the bed or not fully attached to the bed. Check z-offset. 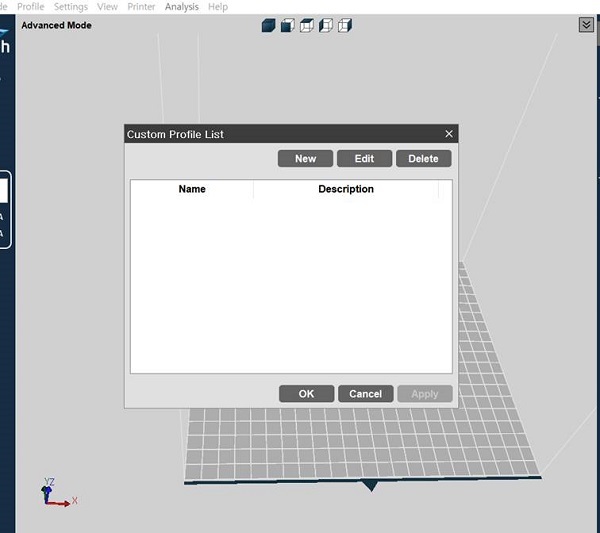 To do so, find the Support tab, click "Video Tutorial" and refer to the 3DWOX Z Offset Setting video. If you have hard time getting connected to the wireless router, please follow the instructions in the order below. - If the SSID of wireless router contains any character that is not English, number or special character, you cannot find it on the 3DWOX's wireless network list. - 3DWOX can only be found within the range of 2.4GHz. Make sure the wireless router's 2.4 GHz band is turned on in advance. - If you access the wireless router by password, make sure it is typed in correctly. If you access the router using wireless MAC, check again to see if Mac Address is registered properly. - Reboot the 3DWOX and try to access it again. -Turn off the router and wait for 10 seconds to turn it back on. Once you turn it back on, check again on the 3DWOX network list. - Reset wireless router with the Network Admin. (If you reset the router, its setting values will be completely erased. Make sure to work with the Network Admin). - If the router is connected but the wireless IP cannot be found, check the router setting with the network Admin. If you use the USB drive in NTFS format, please format your drive to FAT32 format. * Before you start assembling, access to [settings] menu then to [X,Y,Z] menu and move the bed to proper position for assembly. Move the print bed 100 scales downward in Z direction and 100 scales frontward in Y direction. After placing the bed in proper position, turn off the device and remove the power cable.Please work with caution. 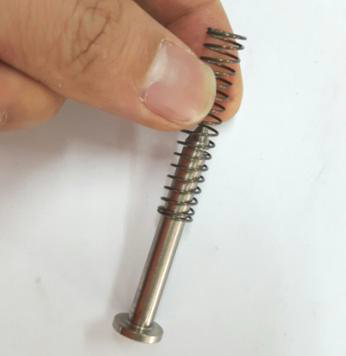 1) Please insert a spring on a stud. 2) As shown in the picture below, there is a hole in bottom left part of the bed where you can insert the stud. 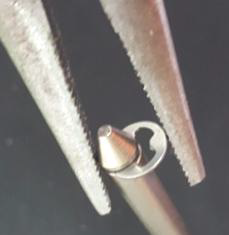 3) Place the head of the stud facing bottom and insert it into the hole. * After assembly is finished, press the stud from the bottom 2 to 3 times to make sure that vertical movement is smooth. 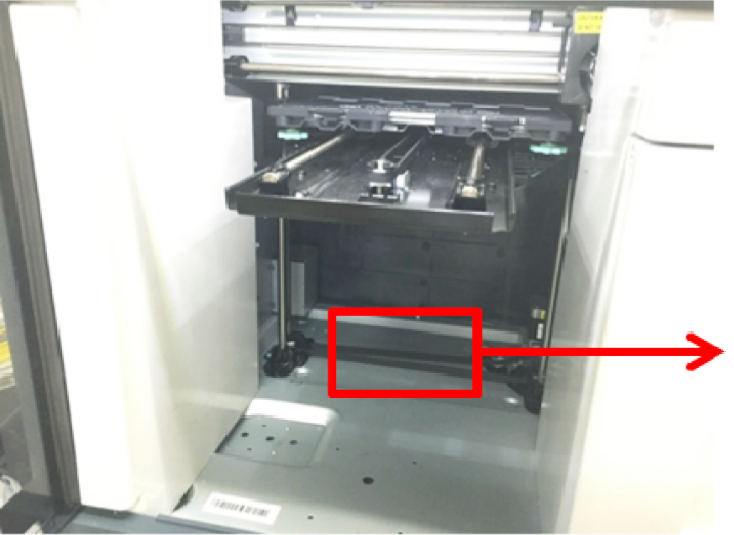 Function of the Stud is to secure the bed not to move after printing is finished. Stud’s presence or absence does not affect the quality of outputs or any other features of the device. 2) Press the tube holder and pull the tube to remove. Use a tool such as a LONG NOSE PLIER and pull to see if it comes out. Slightly lifting the tube insert the Snap-Ring. 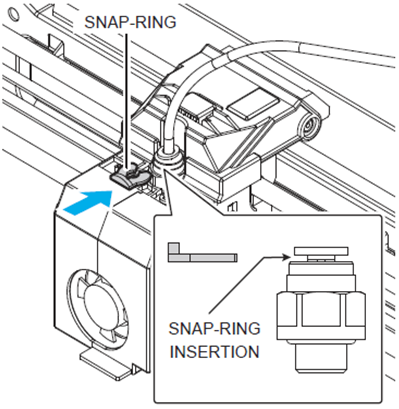 Insert the Snap-Ring in between the Fitting and Holder. - Approximately 1.5mm can be additionally inserted. 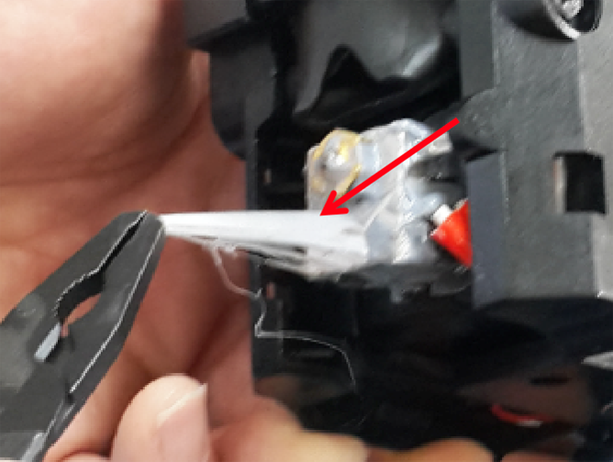 Usual warping occurs when the excreted Filament starts to cool down. The newest Filament that has been excreted on the highest layer has a higher chance of warp, which is the reason why the corners of the 3D models warp. ABS Material has more tendency to warp than the PLA material. - Cold weathers can cause warp in the printed models. 2. Close all the doors while printing. 3. In cases where the shape of the 3D Model has a Countergradient or Bridge shaped bottom, please turn off the fan. - In order to change the Fan settings, change the mode to advanced mode. - Go to Settings - Advanced (2) - Cool - Minimum/Maximum Fan Speed and change the values. 4. Change the Infill rate of the model. 5. Go through the manual Leveling. 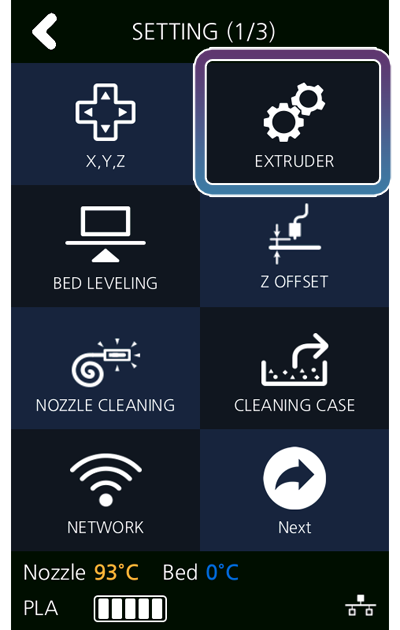 - Please refer to the [FAQs] - [Trouble Shooting] - [Manual Bed Leveling Method] tab. 6. For large sized models with large bottom surface, please print with PLA. - ABS has a tendency to contract easily. 7. Please print the model in the middle of the bed. - Corners of the bed sheet (especially close to the front door) are easily affected by the outside temperature, causing warp. 8. Use as least time as possible for pausing. 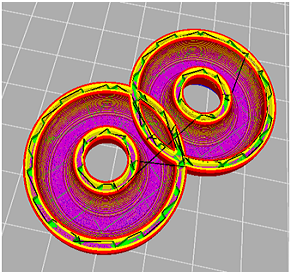 - During the pause, the inner temperature of the 3DWOX decreases, which can affect the warping of the 3D model. 9. Clean the bed surface. 1) Slightly rub the bed surface with sandpaper. 2) Wipe bed surface off with alcohol(ethanol). - Bed surface can be contaminated by oil on hand. ** Before the execution, please go through "Auto Bed Leveling". 4. Push the business card in between the nozzle and the bed and move it around. If you feel a little bit of scratching the bed level is complete. * Caution. There is a spring system under the bed. If you press the bed down while moving the business card around, the bed will move downward, causing an incorrect leveling of the bed. 5. Push the bed back and manually move the nozzle to the left end. 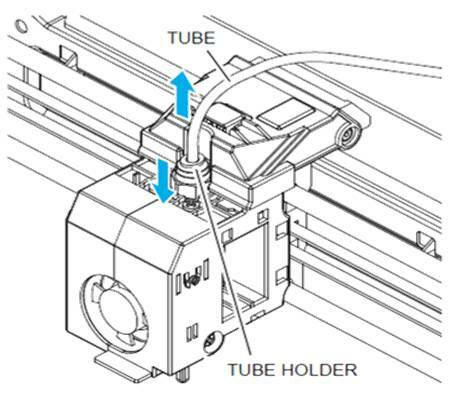 Same way as Step 4, push the business card in between the nozzle and the bed and calibrate until the appropriate height. During calibration, do not use the Z offset menu, but instead, turn the knob. 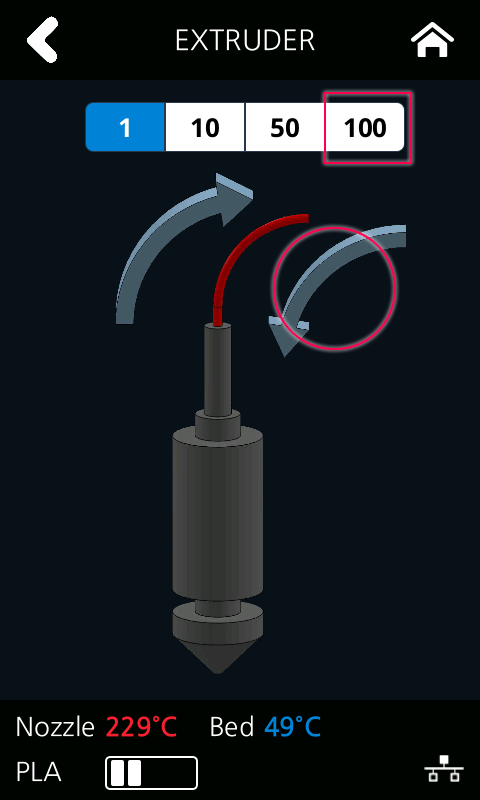 * Rotating the knob by one revolution changes the height by 0.8mm. * Please rotate ONLY the Left knob! 6. After the left side calibration is complete, move the nozzle to the right side. 7. Usual calibration ends after step 6. 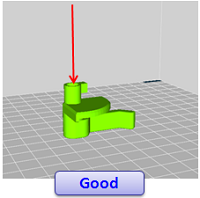 Users can print a small object to see whether the bed leveling calibration is appropriate enough for printing. * The bed leveling becomes very sensitive when outputs are printed without a raft. Unless under certain circumstance, please use the Raft On option when printing. * If Advanced Mode, Check the Settings. * Please be cautious not to harm the harness of the Heater or the Thermistor when removing the Debris. 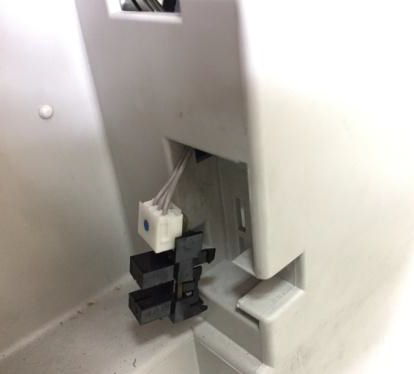 * Please be advised that the Heater Harness may be damaged through contact with a metal. * The Nozzle is heated to a high temperature during the Extruder mode. Touching the Nozzle will cause Burn. 2) After the Nozzle is heated to a high temperature (usually above 200? 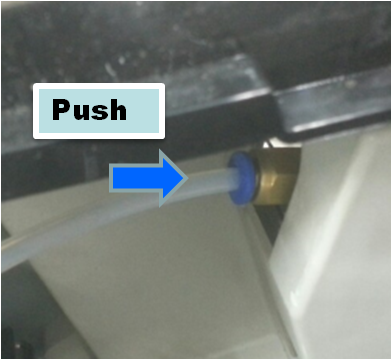 ), Open the upper cover of the Nozzle by pushing the green lever. 3) Hold the Nozzle tightly and remove the Filament Debris using a Long Nose Plier. 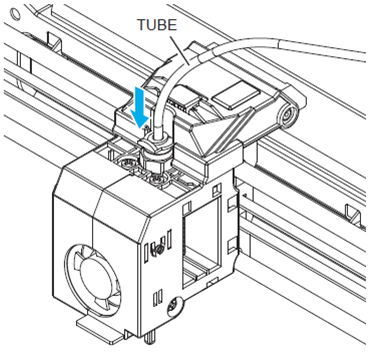 * The Nozzle is heated to a high temperature during the Extruder mode. Touching the Nozzle will result in Burn. 4) After removing the large parts of the Debris, please follow the instructions below to remove the rest of the Filament Debris. 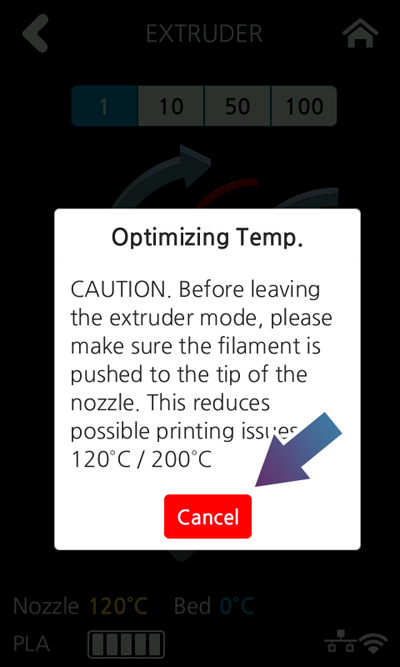 2) When the Nozzle reaches to 130?, Cancel and Exit out of the Extruder mode. 3) Check the UI Nozzle temperature until it cools down to 120?. Use Long Nose Plier to remove the Filament Debris. ※ If the Nozzle cools down to 90 ℃, please repeat from step ①. ※ On a certain temperature (90~120℃), the Filament does not melt, but is in a ductile state, in which the removal is at its easiest. 4) Execute Extruder mode after removing all the Filament Debris. 5) Insert the Filament repetitively until the Filament extrudes out of the Nozzle. 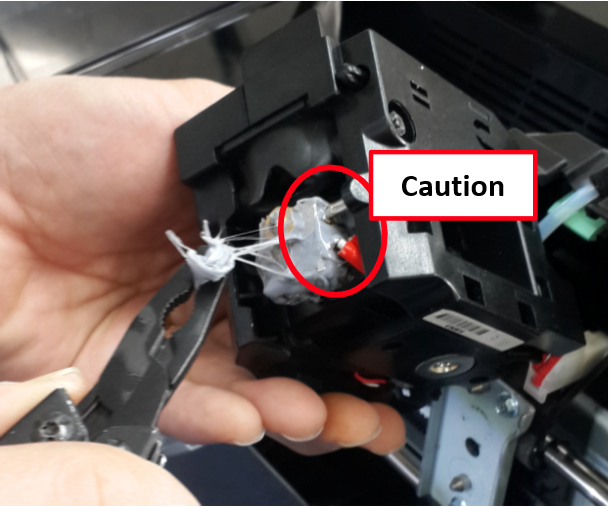 * Please do not touch the Harnesses while removing the Filament Debris. 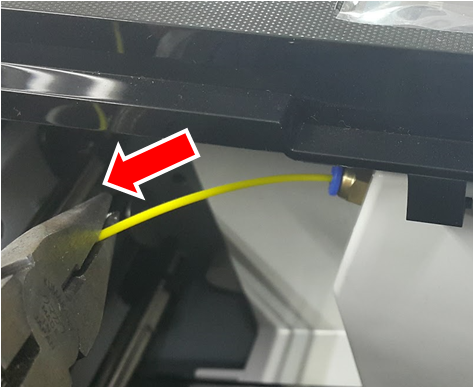 * Please be careful not to touch the Nozzle while removing the Filament. 3DWOX is a high quality 3D printer based on user friendly functions. 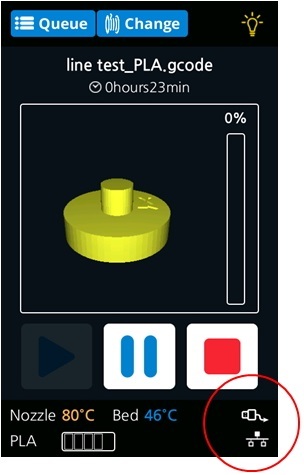 Easy to use TOUCH UI, intergrated with an internal camera, automatic filament installation etc. easy to use even for first time users. Wide variety of PLA and ABS colors. Build your dreams into reality. [Printer] What files can I print with my 3D Printer? Ply. 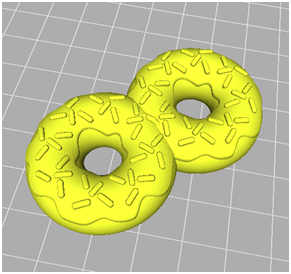 Obj, stl format files are supported. 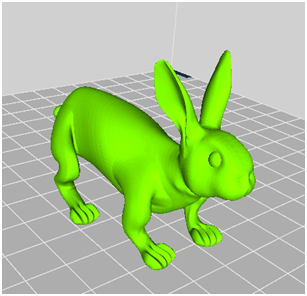 Currently on the basis of Stl files, files under 200mb can be printed. [Printer] What type of filament can I print with 3DWOX? [Printer] How long does it take to print an object? It differs according to the model. 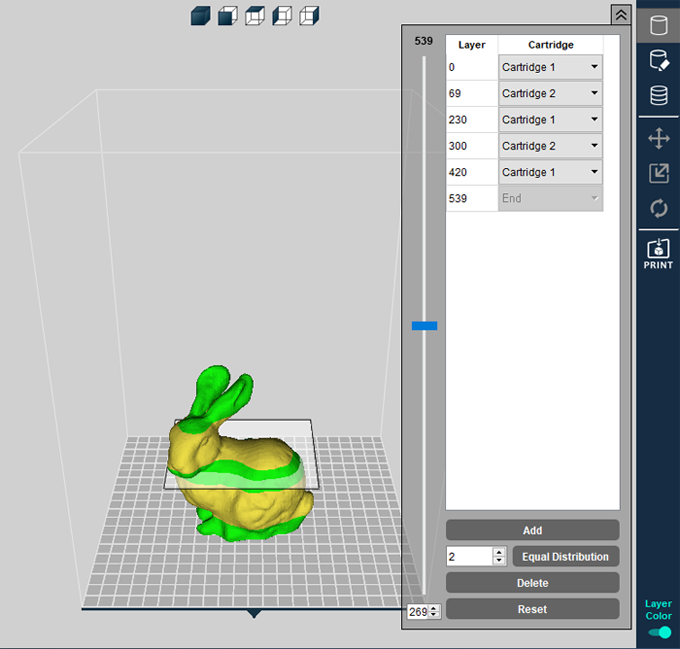 Load the model and convert to Layer view, under the print button the printing duration will be calculated. [Printer] Can I use more than one type/color filament when printing an object? 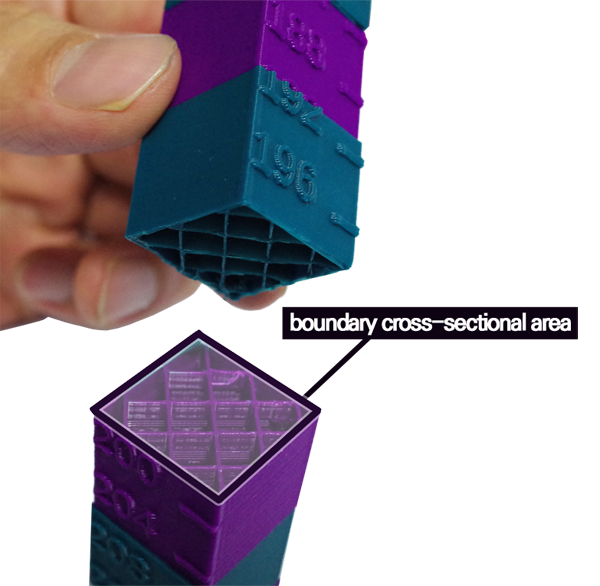 Depending on the height of the printing object, using the cartrdige exchange function, user is able to print with a variety of colors. 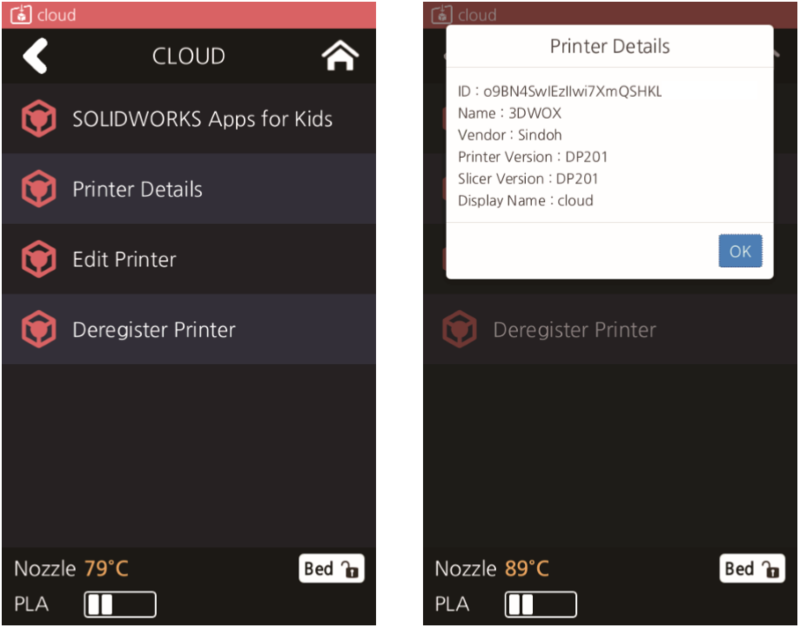 The printer communicates with the Apps for Kids server to perform Cloud print. If this is the first time using the Cloud function, the user’s printer needs to be registered on the server before using this function. 1. Select [CLOUD] on the first page of the user interface. 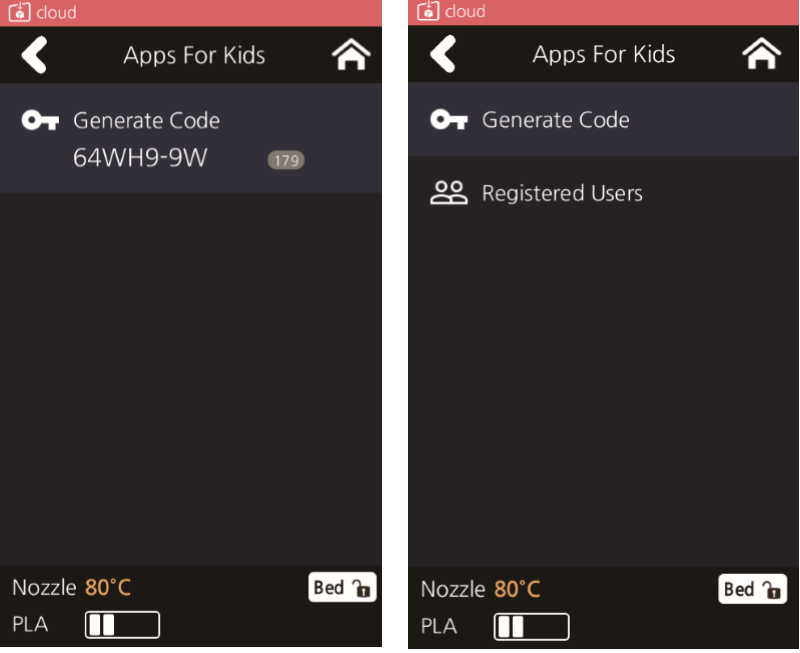 ​** The user can use Apps for Kids to add or remove the Cloud Print function on the first page of the user interface. The machine will automatically reboot once the Cloud function setting is changed. ->​ 1-1. From the home screen, press [SETTING]. -> 1-2. Press [Next] 3 times and select [CLOUD]. Select whether to add or remove the function by using the arrow key and then press [OK] to save. 2. If this is the first time using the [CLOUD] function, the printer needs to be registered first. 3. Once the printer name is registered on the server, the new page will appear and you will have access to different menus. 4. 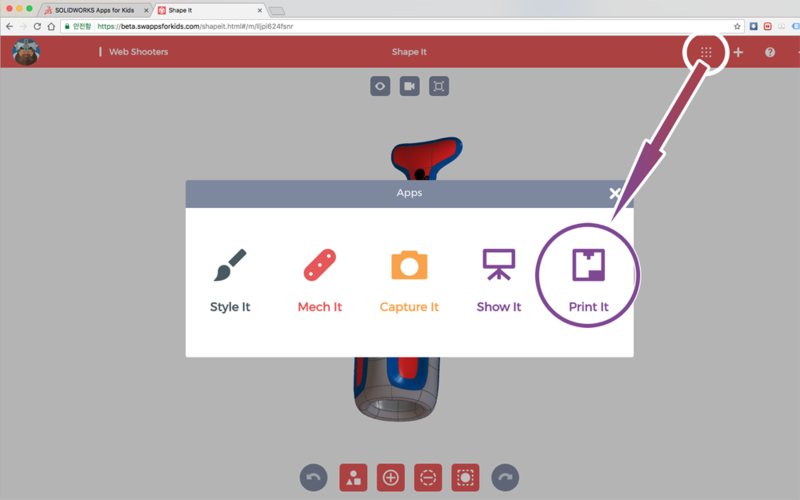 Press [SOLIDWORKS Apps for Kids] and press [Generate Code] to connect to the printer with the account created on “Apps for kids”. 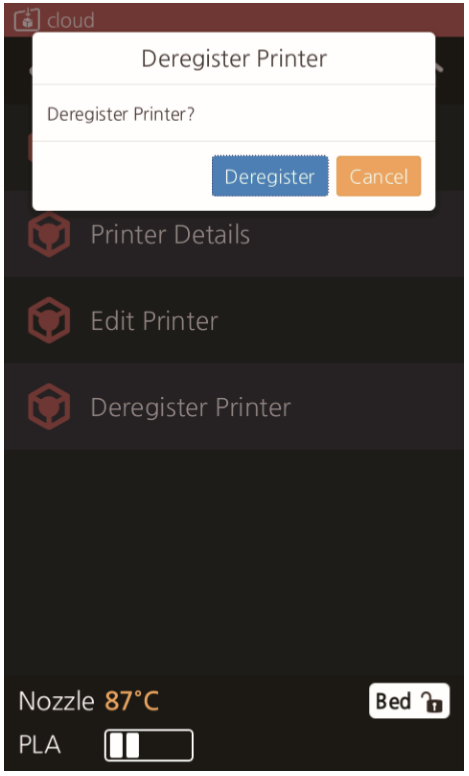 If there are other users registered to the printer, [Registered Users] will appear and this menu will show the list of registered users to this printer. If you would like to remove any users, you can press ( - ) to delete them. -> 4-1. 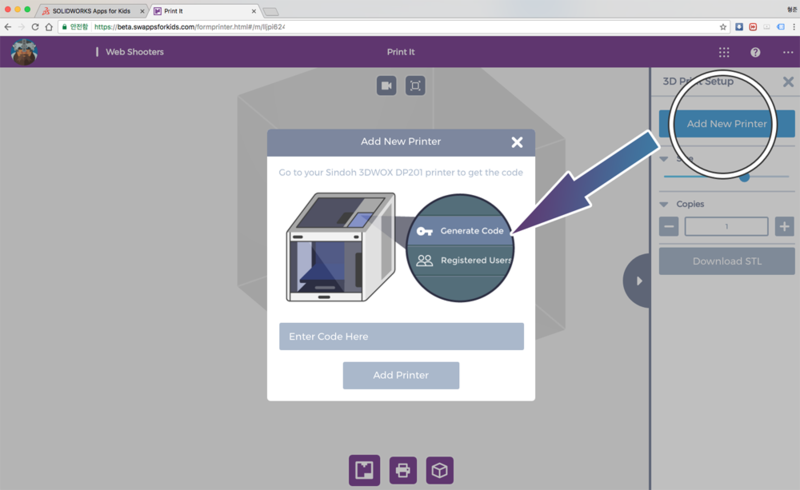 Visit http://www.swappsforkids.com, sign up and register your 3D Printer! Log in to your account and on the Shape It menu, press [Print It]. -> 4-2. Press [Add New Printer] and enter the unique code created through “Generate Code” in the DP201. -> 4-3. 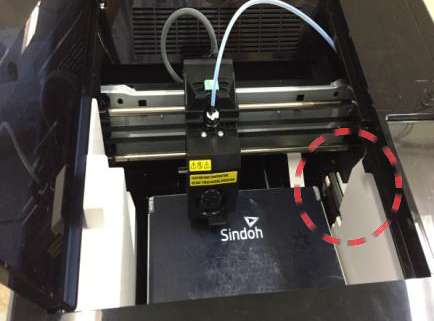 After the printer registration, users can send the sliced output to the registered printer. 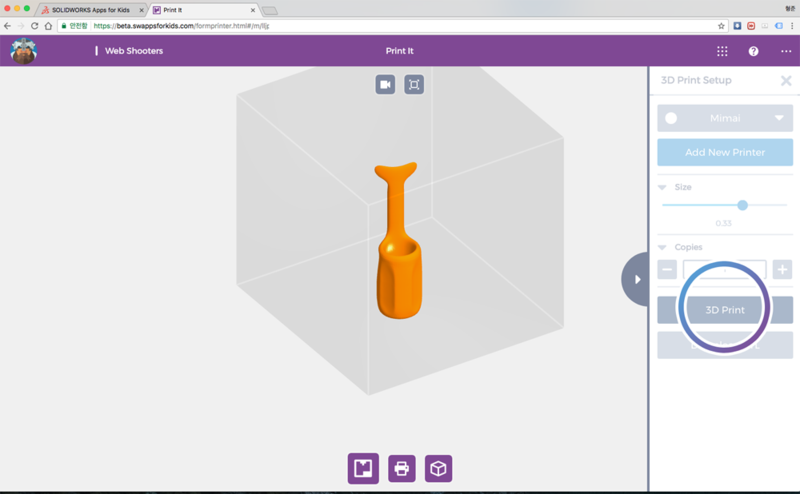 Press [3D Print] from the Apps for Kids shown below, and press [Print Queue] from the the DP201. 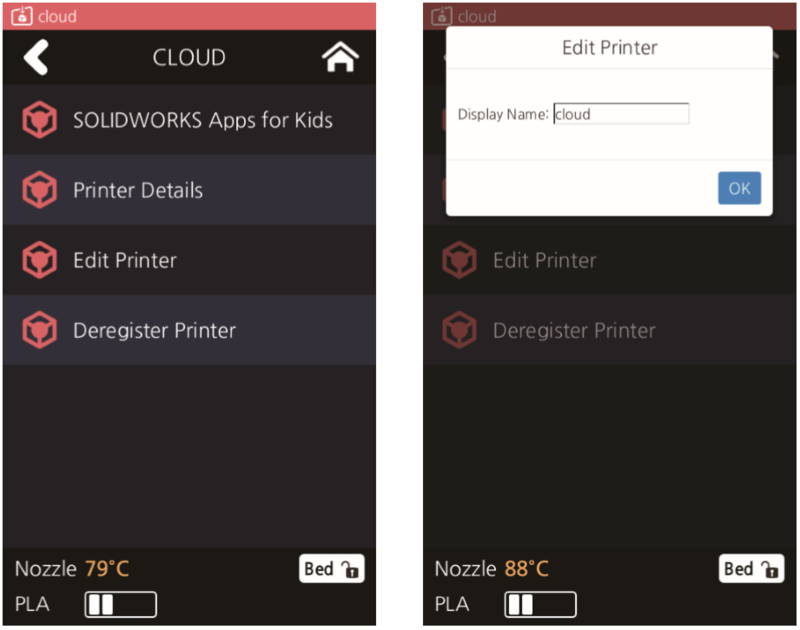 Users can check the gcode file sent from Apps for Kids and directly print it through the the DP201. 5. 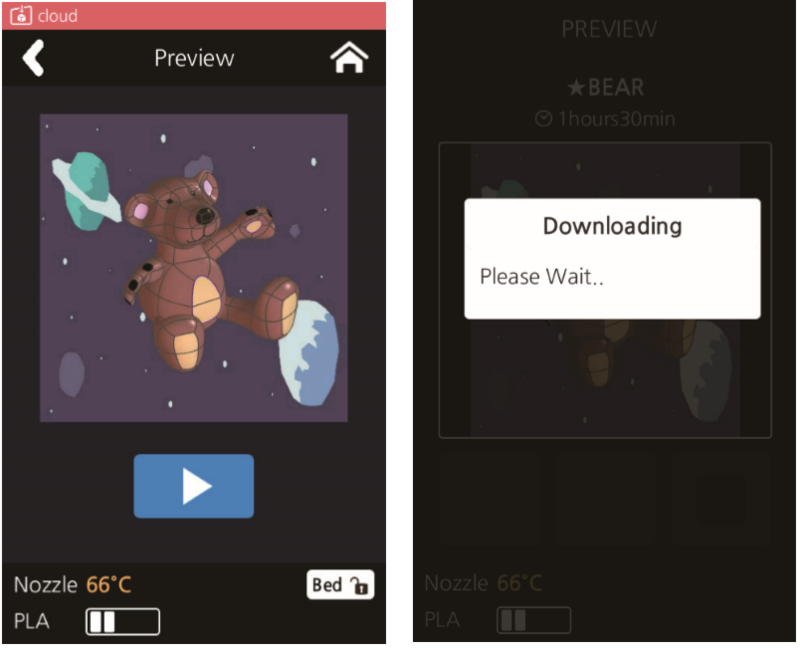 Once the print file is sent from “Apps for kids”, the [Print Queue] menu will appear and this will show the name of the print file and the name of the user who sent the print file. The print files on the list can be deleted by pressing(-). 6. Once the print file is selected, the preview image will appear. Pressing [ ▶ ]​ will start the download of the selected file from the cloud server and then it will start the print automatically. 7. 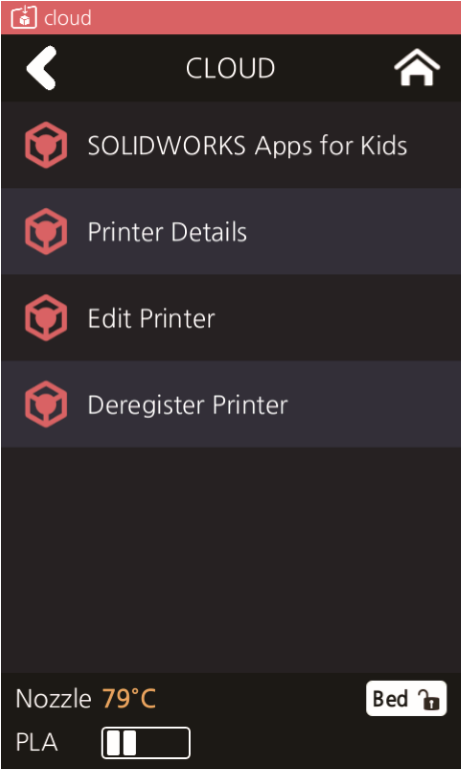 The detail of the printer can be seen from the [Print Detail] under the [CLOUD] menu. 9. The registered printer on the server can be deregistered by selecting the [Deregister Printer] under the [CLOUD] menu. 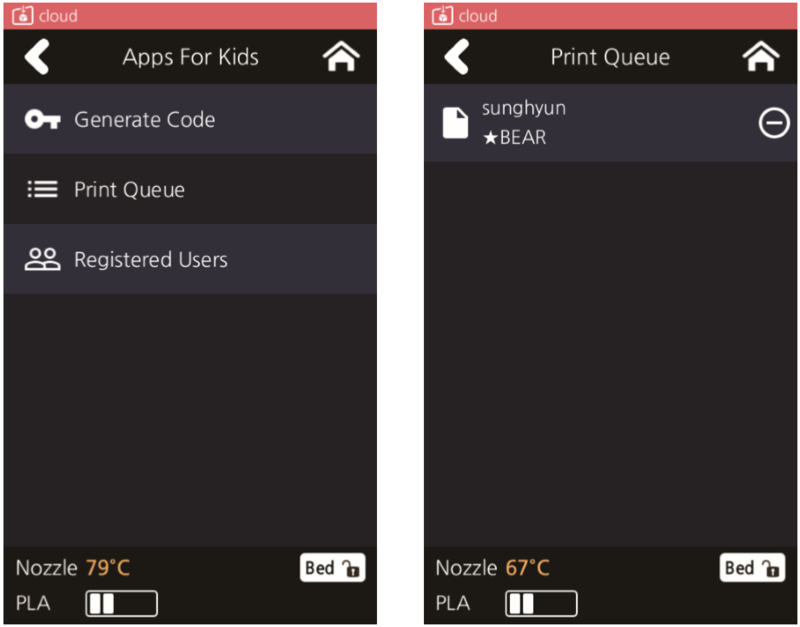 Once the printer is deregistered, the “Apps for Kids” user list and the [Print Queue] list will be reset. In order to reuse the [CLOUD] function after deregistering the printer, the printer will have to be reregistered on the server. [Fillament Cartrige] What is a filament? Material for FFF system 3D printer. The main properties of filament is plastic, however there are filaments where metal and even wood is infused. 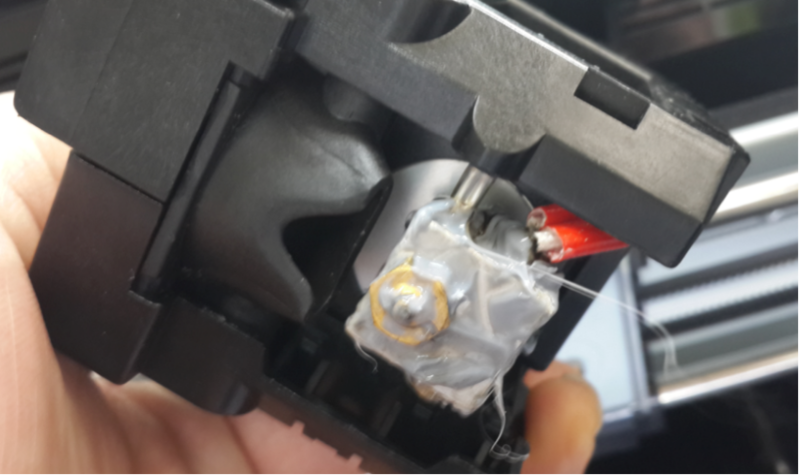 [Filament Cartridge] How to load/unload the filament? 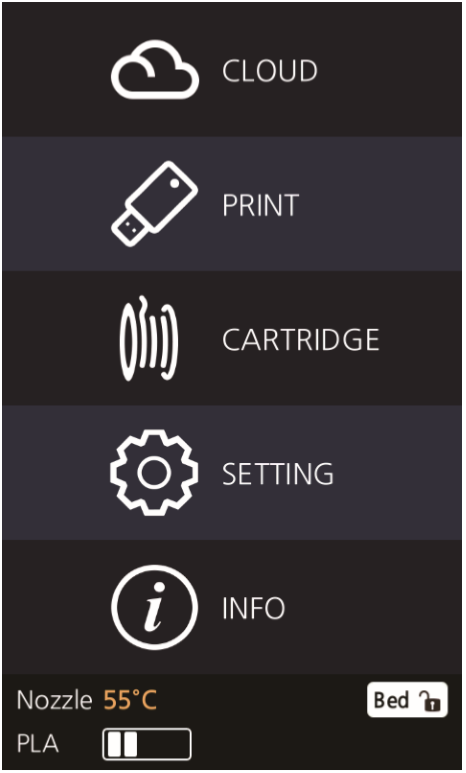 Turn on the printer, press the cartridge button on the UI, pressing the Load button will initiate the loading process. 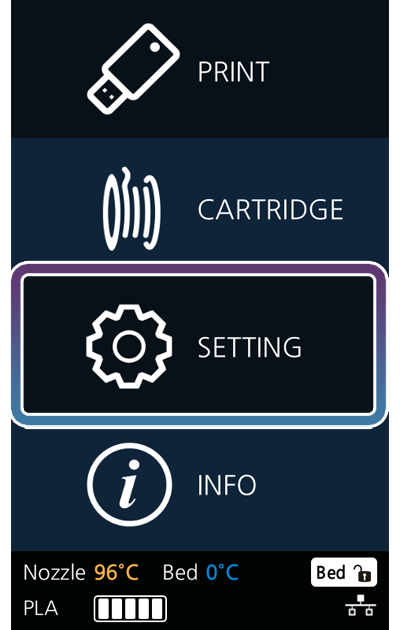 In the loaded status, press the cartridge button in UI, the Unload button will initiate the unload process. [Filament Cartridge] Can I use other filaments other than provided by Sindoh? Currently only Sindoh products and no other products can be used. [3DWOX Desktop S/W] How can I use the profile which is exported in other PC? Question: How can I use the profile which is exported in other PC? Answer: There are two profile import methods. Both are available in advanced setting mode. ① You can import the profile via “Import Profile” under Profile menu. ② You can select profile in SETTING window by using “Custom Profile”. Please refer to the step by step manual below. 1. Select Advanced Mode under Mode Menu. Click SETTING on the left panel. 2. Set the desired values in profile and click OK.
3. Export the set Profile by clicking Export Profile under Profile menu. 1) In Advanced Mode, select Import Profile under Profile menu. 3) Choose predefined profile (ini file). 1) In Advanced Mode, select Custom Profile under Profile menu. 2) Click New in Custom Profile List window. 3) Name the New Custom Profile and select “Exported Profile” in profile option. Then, choose the predefined exported profile (ini file), and click OK. And you can see the newly set custom profile in the Custom Profile List. *Layer Color : Select colors to print by layers. ​- Pause the printing on the desired layer. Unload the cartridge, replace it, and continue printing. 01. 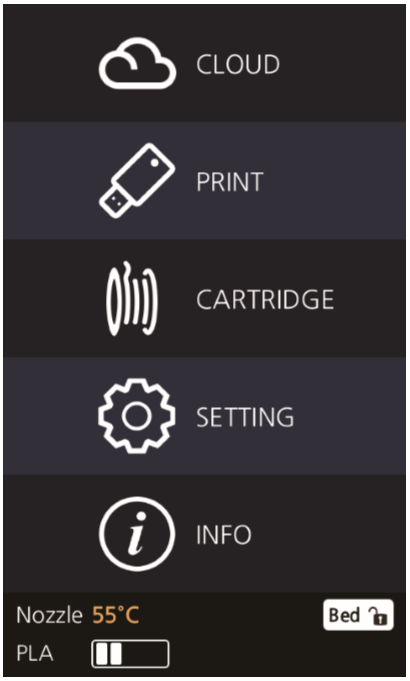 ​The Layer Color is a function to specify different cartridges for different layers. Move the left-side slider to show slider positioned layer and the layer number. 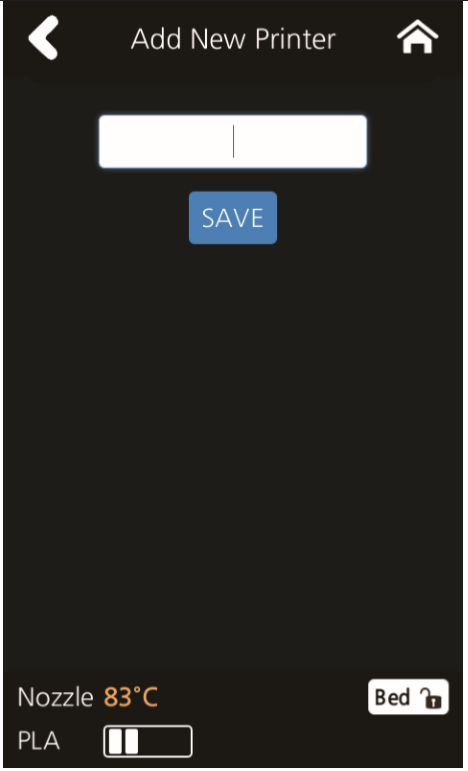 Position the slider at cartridge change desired layer and press the [Add] ​button in the bottom. 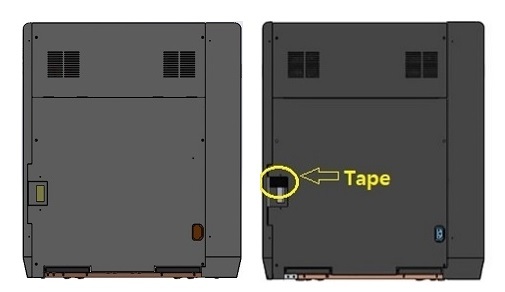 02.​ Then, another tab is created to replace cartridges by layer. Move the slider, and press the [Add] button to add more Layer Color. ->0th to 69th layers are printed by cartridge 1 and 69th to 230th layers are printed by cartridge 2. [3DWOX Desktop S/W] What can I do from 3DWOX Desktop SW? 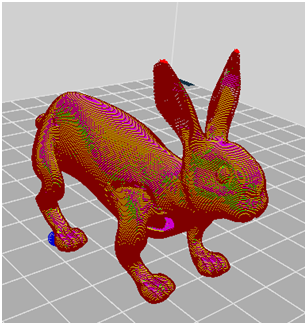 Loads 3D models and converts them into formats that can be printed. Also initiates the slicing process and allows user to preview the model, can edit and build support where its necessary. 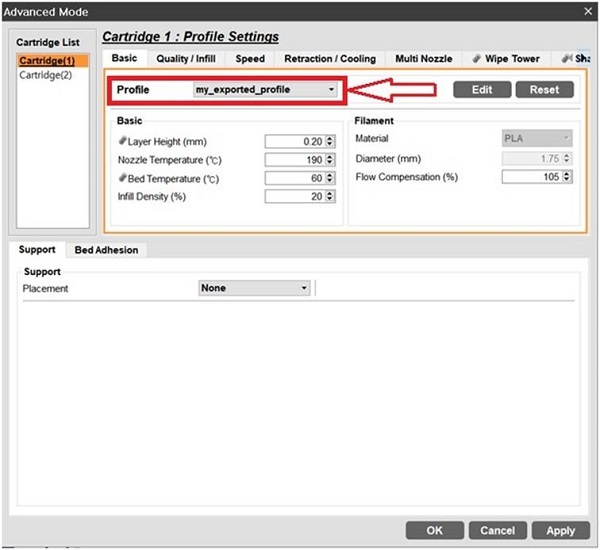 For an additional function program is able to analyze the best printing options. [3DWOX Desktop S/W] What software and operating system do I need to properly run 3DWOX? Any operating system above windows 7 and both 32bit and 64bit or Mac OSX 10.10(above) can use the program and Display Adaptor should support OpenGL 2.0 or above. 3DWOX for PCs can be connected via USB cable or ethernet cables. If you are using USB cable, first check if the cables are connected properly. Then check if the printer is turned on. 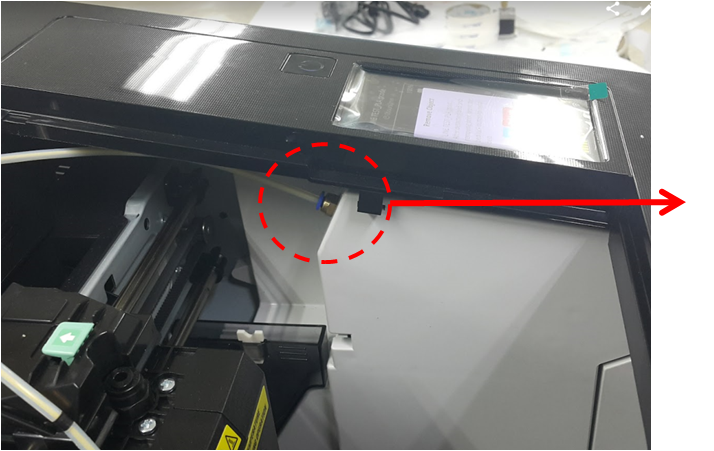 If you are using ethernet cables, firstly please check if PC and network cables are connected properly, If so please check the IP address for the printer and insert it in the web broswer. 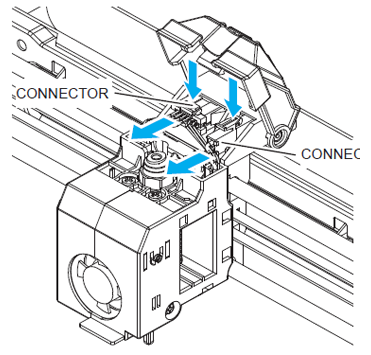 if the printer is properly connected you will be able to view the internal camera. [3DWOX Desktop S/W] What file format can I print with 3DWOX? [3DWOX Desktop S/W] Can I use other company programs to print with 3DWOX? 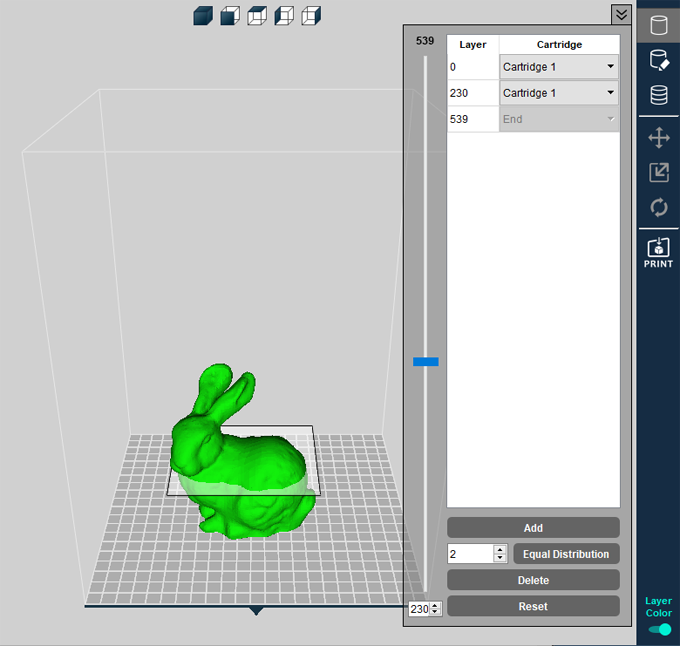 3DWOX DP200 is compatible with Cura. 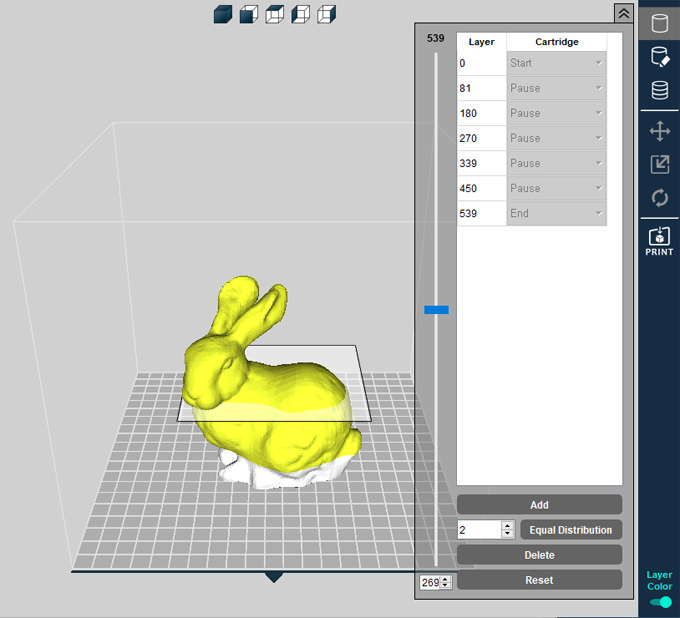 Download Cura, and apply the standard setting mode and use the start-end and g-code. Then it should work. * please refer to the '[Downloads] - [CURA]'. [3DWOX Desktop S/W] The shortcut on the desktop is gone. What should I do? Follow the installation directory and if you find 3DWOX Desktop.exe, run the program, if the program runs properly create a shortcut using the EXE, if it doesn’t visit our website and download the program and reinstall. 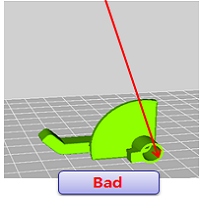 - Output quality could vary depending on how user positions a model on the bed. *Place the model in a position where the usage of support is minimized. 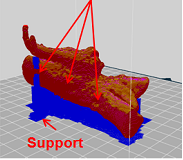 *​If the usage of support is necessary, place the model while considering the fact that parts touching the support would be low in printing quality. 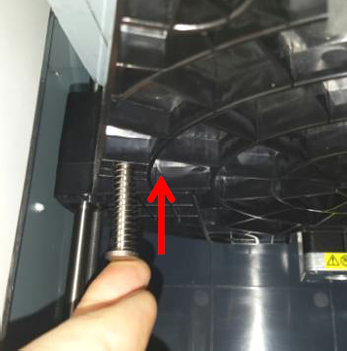 *​If the part has a hole or boss that needs to be precisely printed, it is better to place the part standing up so it wouldn’t need a support. 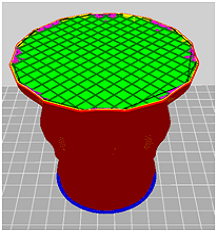 1)Since this boss needs the support, it would be less precisely printed. 2)If this part needs to be precisely printed more than the other part, make sure to place this part facing up so it wouldn't need a support. - The less the usage of support, the better the printing quality. *If the model’s angle is within 60 degrees from the perpendicular, it can be printed stably with out the usage of support. Change the value in the box If you want to set a support for parts with angle less than 60 degrees. *Even if the angle is large, it is still possible to print the model without the support if the model is short in length and has pillars on each side. 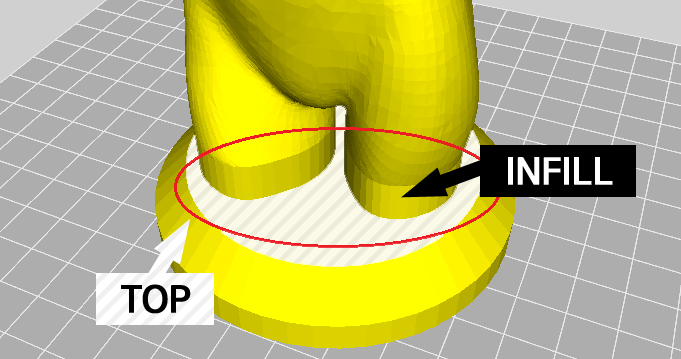 You can stably print the model of length up to 40 mm if there are supports on the each side of model. 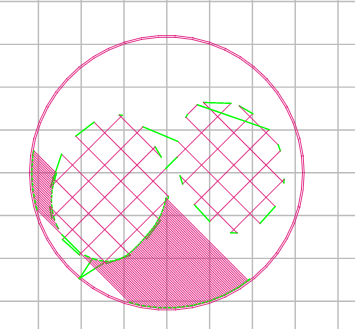 [3DWOX Desktop S/W] What are the differences between 'grid' and 'line' for infill pattern? 1) "Grid" infill is created in the shape of a grid. 2) "Line" infill is created in the shape of a line. The directions vary depending on the layer. 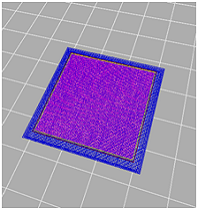 Therefore, it may look like a grid from the 3DWOX desktop. 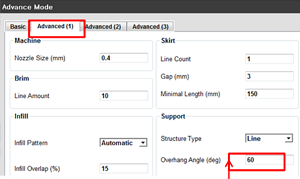 [3DWOX Desktop S/W] Although the 'Line Count' is set as 1 under 'Skirt', a skirt is not being printed. How can it be printed? "Skirt" is a paramater that operates only when "Bed Adhesion Type" is set as "None". 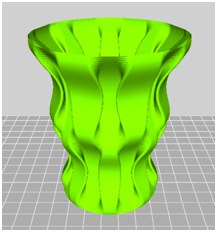 Therefore, you can print the skirt (The Green line shown below) if you set the "Bed Adhesion Type" as "None". 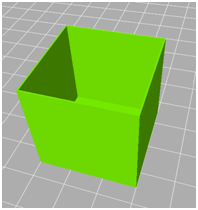 This option is used when a user only prints the surface of model. Since this option only prints the surface, it prints the model’s outer wall without infill and upper/bottom surfaces. 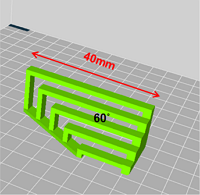 When printing the outer wall, this option prints in minimum thickness about nozzle size. 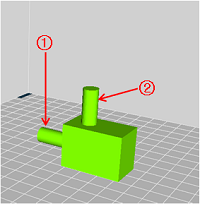 This option is used when a model is only composed of surfaces and has empty internal space as shown in the pictures below. 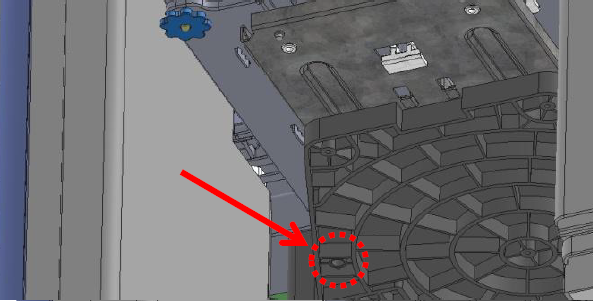 In case of models with no upper/bottom surfaces and has thin walls, it would be hard for normal slicer settings to discern the inside and outside. Therefore, it will create the g code as it in fills the inside of the model. In such a case, this option can be used to only print the outer wall of the model without any infill. 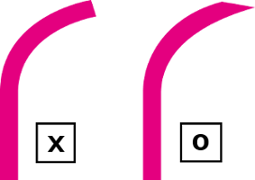 model as it is an opened type. Also when the thickness of the outer wall is about 0.4 mm thin, it would be not possible to print it under regular settings. But when this option is activated, it would be possible to print the outer wall. inner wall, and infill are simultaneously executed. However, we do not recommend this function when slicing a model that requires the solidity, because there is no infill and it prints with the least thickness, which results in printing the model with little solidity. When this option is selected, it slices a combination of two or more different models with overlapped part or only one model with overlapped surfaces. As shown in pictures below, two overlapped models share the inside and create the g-code when they are sliced. When surfaces of the model meet, they create a shared internal space and infill. As shown in pictures above, 2 or more models could be overlapped. Also this option could be used for a single model. For v.1.0.8.0, this option has been activated as default. If you select this option and slice the model above, it starts slicing by integrating as the picture below and filling the internal empty space at the same time. 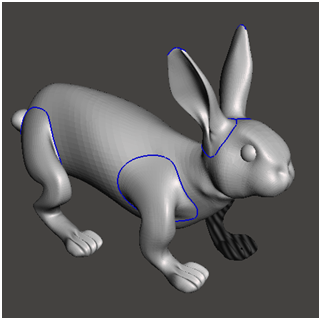 When you need to print just the exterior of the model, this option enables you to slice in case the slicing cannot be initiated due to the entanglement or the overlap of the model. On the same model as above, it creates the G-Code by extracting the exterior and filling the internal space. 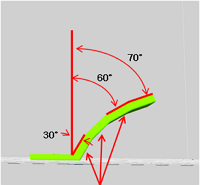 This option is used to resolve an issue when slicing cannot be initiated due to a crack or a hole which are created when surfaces are not properly connected to each other. When you upload a model and slice, you may find that a part of the model disappears from time to time. Such phenomenon occurs due to invisible small cracks or holes, although there seems to be no problem externally. When designing the model, the model with defects may be created under a number of circumstances. For example, they can be created when they have been inconsistently scanned or when they have been improperly attached together. 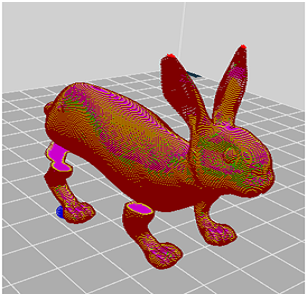 The picture on the left above is a STL model of a rabbit and the picture on the right above is when the STL model is sliced. There seems to be no problem when uploading a model. However, if you initiate the slicing process, you can find that the part between the legs and the body disappears. A defect of the associated part’s data can be suspected. It is difficult to find the models with defect on the current slicing program. You must check on the program that professionally deals with the model. 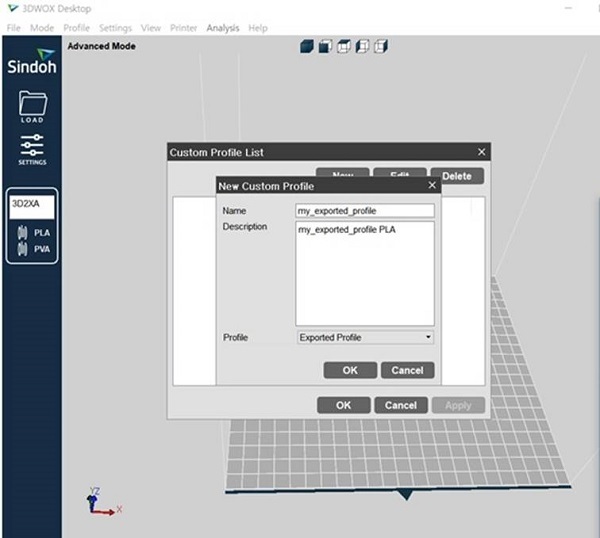 The picture on the left is what appears when the same model is loaded on the program called “Meshmixer” which has been developed by Autodesk. This program simply analyzes the surface of the model and displays it on the screen. On the left picture, you can find the blue lines on the body and the legs of the rabbit. Namely, the model does not consist of a single model. It is a model that is created by attaching the legs and the body. The blue line is created where the legs and the body are attached. In case the size of a crack surpasses a certain size, the slicer cannot create a path of a nozzle and delete it on the screen. This feature attaches these cracks so that the model can be sliced. When you enable this option and re-slice, you can find that the path, which has been fixed to a certain extent, has been created. However, this feature can fix the defects such as small cracks only to a certain extent. The user may not be satisfied with the result. In the cases when the size of cracks and holes are too big, you need a program of which the user can manually modify the model. 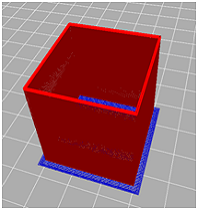 The concept of this option is similar to ‘Close Open Faces’ option above but it is used in a case in which the gaps between surfaces of the model are bigger. 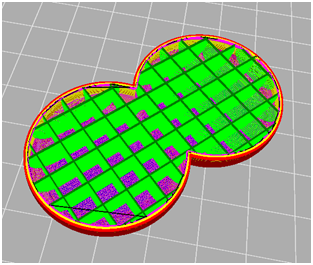 When ‘Close Open Faces’ option is selected, slicer makes decision to fill in the gaps or little holes of the model, but when extensive stitching option is selected, slicer makes decision to connect a surface to another closest surface when there is two or more open surfaces in between the surfaces to be connected. The user may not be satisfied with the result so the usage is limited to the certain extent.? 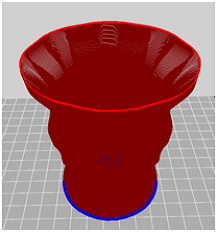 [3DWOX Desktop S/W] A 'gap' is observed on the upper part of the printed object. What measure should be taken? 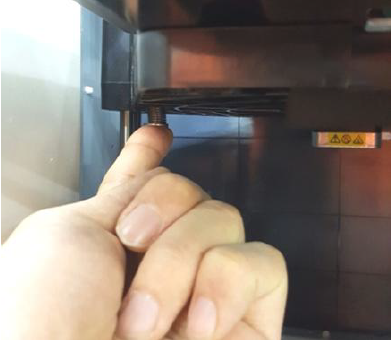 A gap can form in case the upper surface area of the printed object is wide and multiple movements take place inside the model, leading to filament loss. 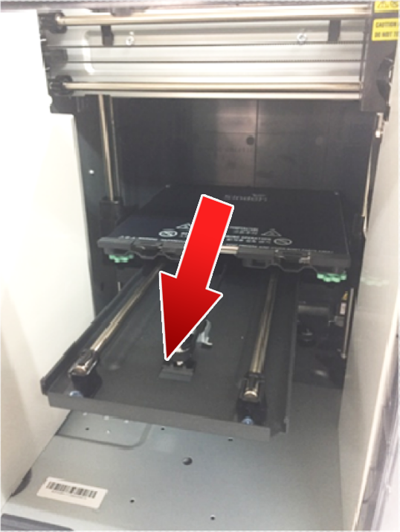 You may prevent the "gap" on the surface of the upper part of the printed object from forming by modifying the settings on "3DWOX desktop." However, be mindful of additional problems. You may modify the settings by clicking "settings" after switching the mode to "Advanced Mode." 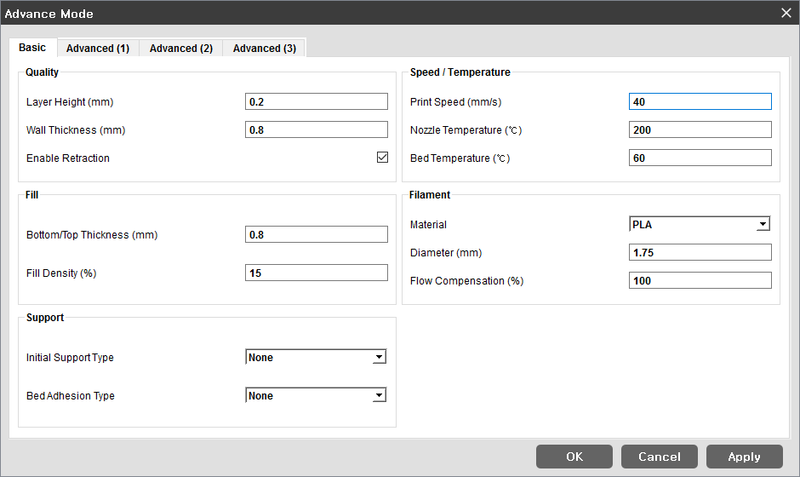 The settings below may change depending on the printing or device conditions. Skin Outline reinforces the outline of skin area so as to help in building the top and infill together on 1 layer. 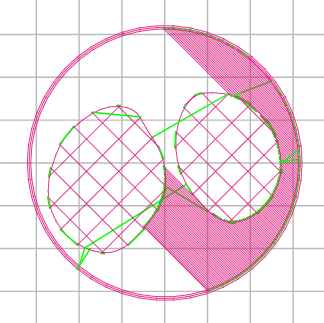 For example of Venus shape, the outline is reinforced between the infill and top of it. For FDM, there can be a gap between the boundary of leg line and top plane of Venus shape. With the skin outline, the gap of boundary line can be improved. The following image will help understanding. The outline is reinforced between the infill and top. 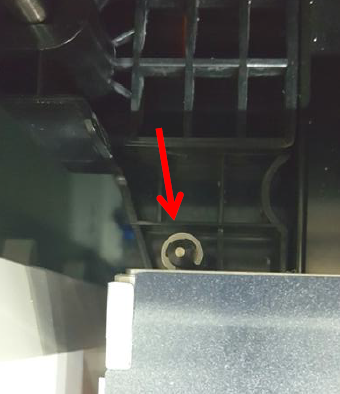 [Operation/Maintenance] How do I clean the printer? 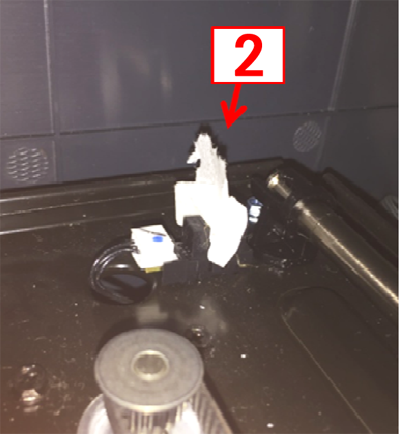 For the cleaning case, the printer will notify you on when to clean the case, follow instructions. 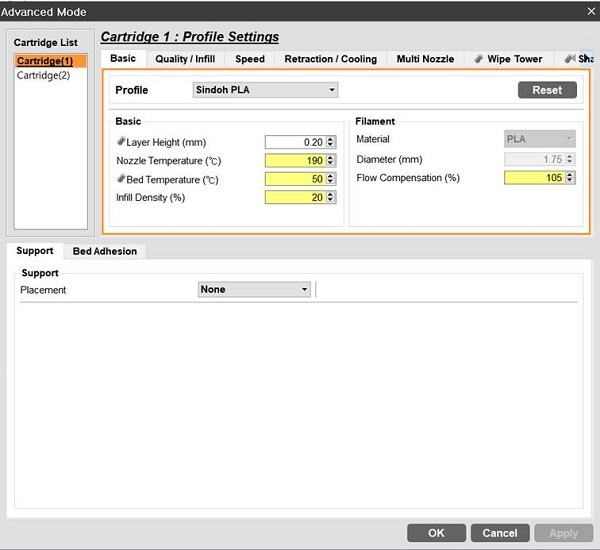 For the nozzle in times of changing material or changing color of filament, under settings initiate nozzle cleaning. [Operation/Maintenance] What is the purpose of bed lock and why and when do I want to lock and unlock? The purpose of the bed lock is to easily reinstall the bed sheet on to the bed. When you are reinstalling the bed sheet, if the bed lock button is enabled, it will hold the bed so that the bed won't be pushed back when you slide the bed sheet on to the bed. Aside from this bed lock function, when the print is completed, the bed is automatically lowered to the bottom and the long screw that is on the bottom of the bed holds the bed which works the same as the bed lock function so you don't have to worry about pressing the bed lock button when the print is completed. 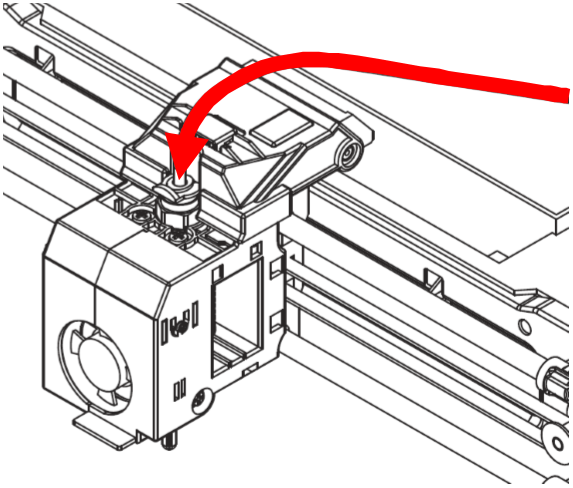 You will be using the bed lock button when you have to reinstall the bed sheet after you cancel the print or in situations where the bed is not at the bottom of the printer. 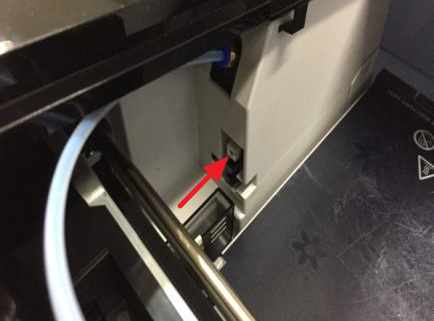 [Operation/Maintenance] Can the USB stick be removed during printing, and should the bed be releveled between each print? You may remove the USB stick when the X-sign (Refer to the picture below) disappears on the screen. The bigger the size, the longer it will take for the X-sign to disappear. There is no need to re-level the bed in between prints unless the device is substantially impacted.We recommend that you level the bed every other week if you print once or twice a day. However, there is no need to level the bed as long as the object is properly attached to the bed when printed. [Operation/Maintenance] Has anyone experimented with faster print speeds? The default seems to be 40 mm/s, do you think the printer would work well at higher speed? The maximum speed is 200mm/s. We recommend that you print at a speed of 100mm/s or under. However, printing at a speed of 40mm/s or lower is recommended due to a noise. [3DWOX Mobile] How do I install the app for my mobile device? Search 3DWOX Mobile in each respective appilcation stores, for iphone app store and for android, android market. 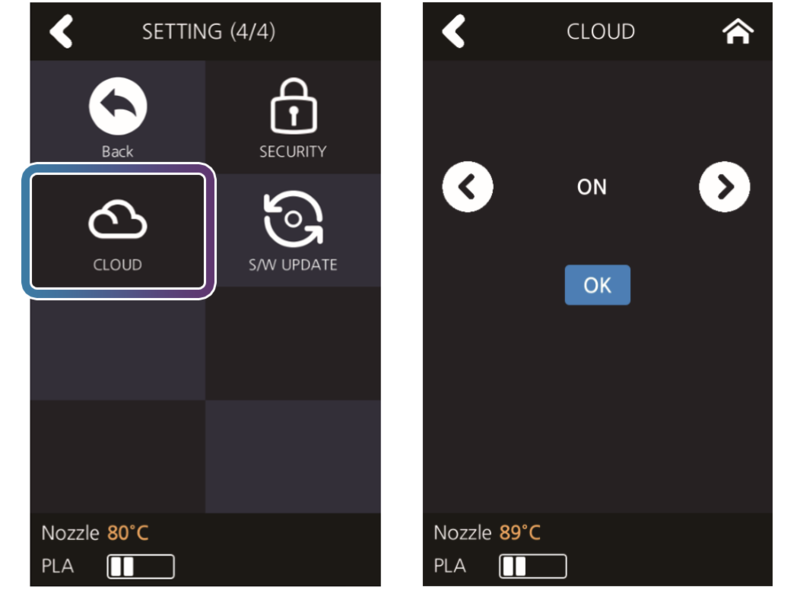 [3DWOX Mobile] What can I do from my mobile device? You can find the printer within your network and cancel the printing process. [3DWOX Mobile] Which operating systems are supported? Android and iPhone are supported.